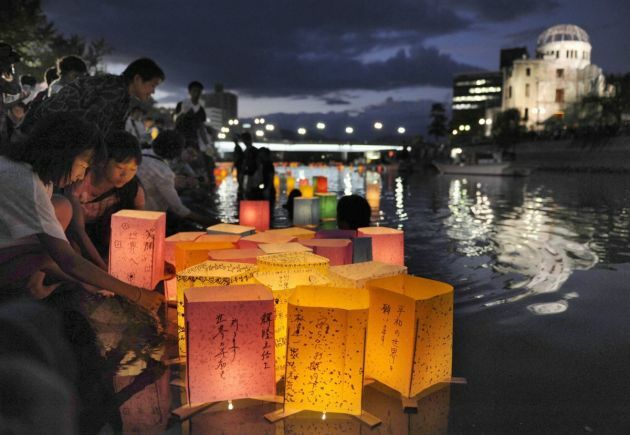 (Photo: REUTERS / Kyodo)People release paper lanterns on the Motoyasu river facing the gutted Atomic Bomb Dome in remembrance of atomic bomb victims on the 67th anniversary of the bombing of Hiroshima, in this photo taken by Kyodo August 6, 2012. During the first half of the steamy month of August Japanese and the people throughout the world remember the events that changed modern warfare forever, killing hundreds of thousands of people with two foul swipes. On August 6 people in Hiroshima observed a minute of silence to mark the 68th anniversary of the dropping of the first ever dropping of a nuclear bomb on a city. Three days later another atomic bomb was dropped on the Japanese city of Nagasaki, the Japanese city with the highest number of Christians, most of them Catholics. "We Japanese are history's sole victims of the nuclear attack of the nuclear attack and we have the certain responsibility to bring about a world without nuclear weapons," Japanese Prime Minister Shinzo Abe told the crowd. "And it is our duty to continue to remind the world of [nuclear weapons'] inhumanity." Hiroshima Mayor Kazumi Matsui made a similar pledge, labelling nuclear bombs the "ultimate inhumane weapon and an absolute evil." The atomic bombings of Hiroshima and Nagasaki by the United States during the final stages of World War II in 1945 were the two events in which nuclear weapons have been used in war. They followed a firebombing campaign that destroyed many Japanese cities and on the southern islands of Japan allied forces were meeting fierce ground resistance. Around 50,000 people were among those who gathered in a peace park in Hiroshima for a solemn ceremony on Tuesday. About 140,000 were killed in the days following the bombing of Hiroshima. The nuclear bomb dropped on Nagasaki, killed about 70,000 more people. Commenting on the nuclear bombing the general secretary of the World Council of Churches (WCC), Rev. Olav Fykse Tveit said events in Northeast Asia this year "dramatize how much the region and the world still live in the shadow of mass destruction." Tveit said, "The God of life calls all of us to take up [the survivors'] tireless cry and make certain that a Hiroshima or Nagasaki bombing can never happen again." He noted that churches from around the world are coming to South Korea soon for the 10th Assembly of the WCC where participants will learn the Hiroshima legacy from churches there. These include Cold War rivals North Korea and the United States "still brandishing nuclear weapons," increasing U.S. military deployments in the region, and government officials in Tokyo speculating about Japan developing nuclear weapons. The world churches leader said 60 years after the Korean War armistice, "none of the antagonists have a peace treaty…but every country in Northeast Asia has its own nuclear arms or accepts protection from U.S. nuclear weapons." Tveit cited Buddhist, Christian and civil society advocacy that the Korean Peninsula "must be freed of nuclear weapons as a cornerstone for any durable peace." The finest tribute to the two destroyed cities, Tveit said, will be to achieve the elderly survivors' undying hope that no one suffers the fate of Hiroshima and Nagasaki again. It means protecting "God's gift of life … for the good of all." Japanese author Eiichiro Tokumoto in his 2011 book "1945 Under the Shadow of the Occupation: The Ashlar and The Cross" focussed on the spiritual aspects of the immediate post-war period in his country. He wrote that after the destruction of the Japanese empire and its surrender in August 1945, a "spiritual vacuum" emerged that the country's de-facto ruler, General Douglas MacArthur, sought to fill with religion and philosophical ideas still new to Japan, from Christianity to Freemasonry. MacArthur was a devout Episcopalian and an active Mason. While he tried to promote Freemasonry, Emperor Hirohito was seeking closer ties with the Vatican. The Holy See, well known for its hostility to Freemasonry, was competing with the brotherhood to export its own influences to postwar Japan. Tokumoto documents MacArthur's efforts to persuade missionaries to intensify their efforts among the Japanese population in hopes of providing a counterweight to the growing appeal of communism in the nascent years of the Cold War. His book under the Japanese title Japanese: Ichikyuyongo, Nihon senryo - furiimeisun kimitsu bunsho ga akasu tainichi senryaku was researched from declassified documents obtained in the U.S., Europe and Asia. Among them was a report of meeting between MacArthur and two American Catholic bishops, John F. O'Hara and Michael J. Ready, in mid-1946. After a three-week trip around Japan, in which they met with religious and political leaders as well as Imperial Family members, the bishops reported to the Vatican that MacArthur encouraged the Catholic Church to attempt to convert the Japanese en masse. The bishops said that MacArthur, from his experience in the Philippines, believed the Catholic Church held particular appeal to the Japanese because the tradition of seeking absolution "appeals to the Oriental." "The General is fearful that if the Church does not quickly send an army of zealous Missionaries to Japan, Communist agents will obtain the converts who should be gained by the Church," the bishops wrote. The mass conversion of Japanese to Christianity never took place, but Catholics remains the biggest Christian group in Japan. Of Japan's 127 million people, about two percent are Christians.